As internet companies get more tremendous and central, the ability for those companies to work together for their best interest increases. This only leads us toward less innovation and keeping the status quo, but technology should always push forward. Some sources claim Google holds 40% of all web traffic. Then throw in a few, non-competing Internet Service Providers and our internet looks more like the only grocery store in town rather than a city with many options. Then throw in governments and other centralized powers. They can force these large companies to hand over your information or make the company delete your account. This is a jab to free speech around the world. We as a society can not progress towards a better life for all when a small group can silence an idea in the blink of an eye. Even if the government are uninvolved, these internet giants can delete whatever they want. Just because people of power in these companies don't agree with an opinion does not mean that opinion should be snuffed out. Ideas that oppose our own is the best way to learn and grow as an individual. When these companies censor content and delete accounts, they are saying that only ideals they agree with are correct. This implies that all others are wrong and they might be, but we as the user should make that choice for ourselves. This is all a byproduct of centralization, and we are part of the problem. Even though we are not in favor of these practices, we are still using services like Twitter and Facebook. I may agree with the opinions of these companies and may feel the content being deleted is hateful. However, that does not mean they should not have a voice. There is an alternative, and it is picking up speed. We have to hop on and show the world the beauty of decentralization. Decentralization is when there is a lack of central power, or the power is distributed among the members of the service. Many services operate in this manner in our day today. These include services like waste disposal, some mail services, and water purification. These are not hard and fast examples since the level of decentralization varies from city to city. When it comes to computer technology and the Internet, we are still scratching the surface. Even though the Internet was decentralized in its infancy. 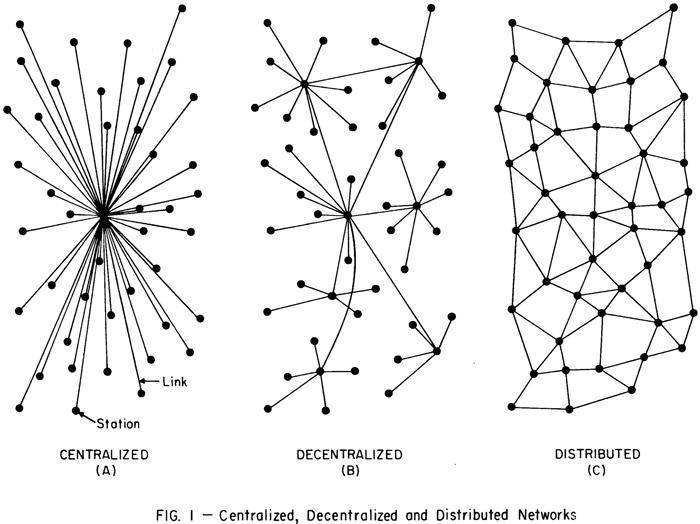 I'd like to point out I am using "decentralized" networks as the example here in a broad sense. There are also "distributed" networks that achieve the same end goal and are more robust. Bitcoin was the first of its kind leading the way for others like Ethereum and Steem. A blockchain does not have to be decentralized even though that is the connotation. When a blockchain service is decentralized, that is when it can shine to its real potential. Let's focus on Steem as our example since it is providing a service that is traditionally centralized while using a blockchain. Steem is a platform that works well for blogging and a slew of other content like photo and video sharing. What makes Steem decentralized is the blockchain. Anyone can run a node on the network and hold a complete copy of all the Steem content. That is the core of a decentralized platform. If one node goes offline, the system keeps moving along. All but one node can be destroyed, and the network stays alive. As we talked about earlier, Steem is a blockchain based service, but not all decentralized platforms need to be. Mastodon is an excellent example of a decentralized network that is not based on blockchain technology. Anyone can start up a mastodon server and can communicate with the rest of the network. Each server holds the content of any user on that instance. Even though the content is not stored on a single server or in a centralized way, we can still communicate. If you are on mastodon.social and I'm on mastodon.xyz, you can follow me, like my posts, and reply just like you would on a centralized service. A decentralized network is harder for governments to censor. If one server goes bankrupt or starts acting unethically, the network persists so you never have to worry about migrating your friends and audience to a yet another platform again. They nailed it on the head. We will never have a free and open Internet without making the services (and hopefully the connections into) decentralized. Whether this is done the way, Steem is or using Mastodon's approach. It is important we keep this trend. When you or another person has something to say that is not in favor of a government or large company; you should be able to speak your mind with no one of power taking the platform or your soapbox away. This even goes for the platform itself. With Steem, you could get downvoted into oblivion, but your work is still there. The site you use to access the Steem blockchain may end up censoring your content, but you could make a website to display the material because it is still there. As for services like Mastodon, if you say something that gets your account deleted on one instance, you can make an account one another that allows the content you create. This is "Internet 3.0," and this is how free speech wins.